The author is a forage extension specialist with the University of Kentucky in Lexington. Every forage producer knows that maturity is the most important factor in determining forage quality. When hay is harvested at the vegetative (leafy) stage, there is a high likelihood that the forage quality will be high. Grass stands harvested at the boot stage (before seedhead emergence) will have increased yield over vegetative stands, but the quality is lower. Usually though, boot stage harvests provide a good compromise between yield and quality. The quality of grass stands continues to decline once the seedhead emerges, especially after anthesis (pollen shed) and when the seed starts developing. Most of this is common knowledge, but the issue becomes more complicated when grasses are mixed with legumes. A preferred mixture in many high-value hay markets is alfalfa-orchardgrass, especially with horse customers. Hay buyers want a high-quality leafy mixture, but it can be difficult to determine when to cut, especially at first cutting. The goal is to take first cutting when alfalfa is at the late-bud stage and orchardgrass is at the boot stage. Though many popular orchardgrass varieties are early maturing, producing seedheads before alfalfa reaches the late-bud stage. The simple solution is to choose late-maturing orchardgrass varieties, but this can be easier said than done. Many companies sell late-maturing varieties, but it is often hard to determine what is meant by “late maturing” from a company advertisement. A recent journal paper published in Crop, Forage & Turfgrass Management by Joe Robins and other researchers provides useful information about orchardgrass maturity and also shows why it can be difficult to choose late-maturing varieties adapted to your region. 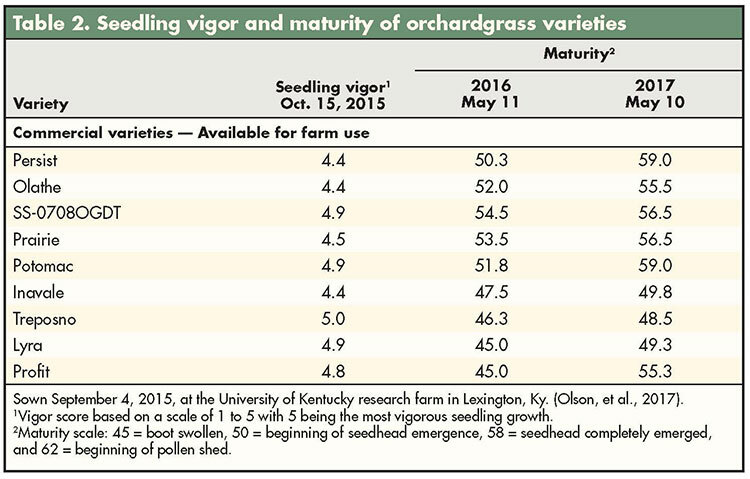 When orchardgrass advances into reproductive stages, forage quality drops rapidly. In the study, 13 orchardgrass varieties were tested across four years at university and USDA research sites in Kentucky, Pennsylvania, Utah, Virginia, and Wisconsin. The focus of this study was to determine how these varieties compared for maturity, yield, stand survival, disease rating, spring regrowth, and fall regrowth across a wide range of locations. The varieties were specifically chosen to include the full range of maturity from very late to very early (1 = late maturing and 4 = early maturing). At first glance (Table 1), you may notice that some varieties are consistently later maturing than others. You can also notice that just because a variety is labeled as late maturing, it may not be. Pennlate, developed as a late-maturing variety in Pennsylvania, was actually in the middle of the pack. Barlegro was always the latest maturing variety or in the latest maturing group statistically. Other consistently late-maturing varieties included Dascada, Excellate SA, and Harvestar. Where each variety ranked for maturity varied from state to state. Interestingly, in Wisconsin there was only a 0.7 out of 4.0 spread from the earliest to the latest maturing variety. Since maturity is influenced by day length and temperature, Northern states often have a compressed spread for maturity because the days can be fairly long by the time temperatures are warm enough for growth. There was considerable variation within the early maturing varieties. Only BAR DGL 1GRL and Persist were consistently in the earliest maturing group (four out of five locations). Some varieties were early maturing in one state — Potomac in Virginia, but then late maturing in another state — Potomac in Pennsylvania. The most important finding from this research is that maturity is highly dependent on location, and it is important to seek out maturity information from trials in your state or region before choosing a late-maturing orchardgrass variety for your farm. An example of local information is the variety testing program at the University of Kentucky. The coordinator is Gene Olson, and he conducts both yield and grazing variety trials across almost 20 forage species each year. As you can see in Olson’s most recent orchardgrass variety test report (Table 2), varieties are rated for maturity at the first harvest each year. Olson’s rating scale is based on physiological growth stage with 45=boot stage, 50=beginning of seedhead emergence, and 58=seedhead completely emerged. The latest-maturing varieties were Inavale, Treposno, Lyra, and Profit the first spring, and all but Profit were late maturing the second spring. The shift in maturity rating for Profit brings up an important point. Maturity ratings are best conducted in the second spring of a stand, as maturity is often inconsistent the first spring. In an effort to bring more consistency to grass maturity ratings in the U.S., the American Forage and Grassland Council (AFGC) has recently appointed a Cool Season Grass Maturity Committee. This committee is comprised of seed company and university representatives who have collected seed for a number of varieties of orchardgrass, tall fescue, timothy, Kentucky bluegrass, smooth bromegrass, and annual and perennial ryegrass. Each variety is being evaluated for maturity using a standardized protocol at company research stations in Oregon, Iowa, and Kentucky. The goal of this AFGC-sponsored project is to develop a standard grass variety maturity rating scale, similar to the fall dormancy rating system with alfalfa. This standardized rating scale would not only identify the earliest and latest orchardgrass varieties, but it would also allow comparisons across grass species. 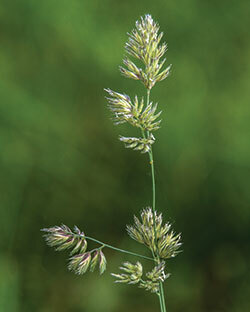 For example, producers could decide if a specific early-maturing timothy variety actually had the same maturity date as a late-maturing orchardgrass variety. 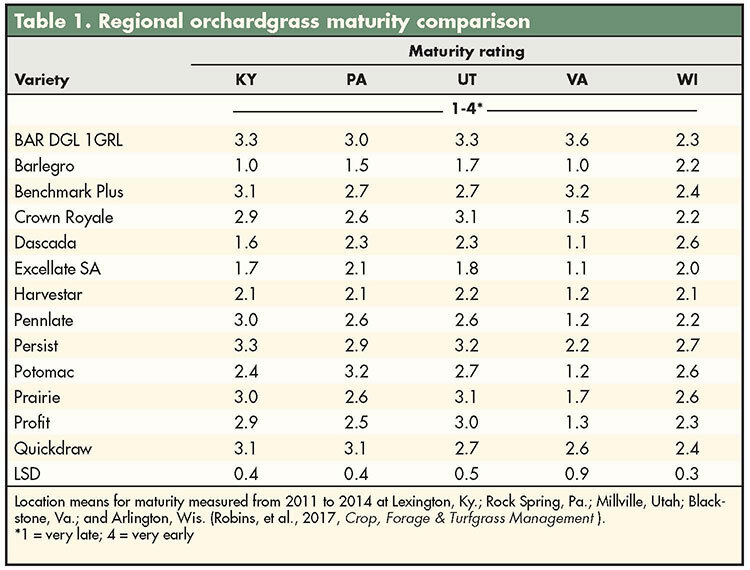 Fortunately, there is a growing number of variety options for late-maturing orchardgrass on the market today, but always remember to base your selection criteria on factors beyond just maturity such as forage yield, persistence, and general adaptation to your region. This article appeared in the March 2018 issue of Hay & Forage Grower on pages 10 and 11.